The following post was writting by Marcia Washington OTR/L, who has been practicing pediatric occupational therapy for 20 years. What is sensory integration and how can I help my child with it? Picture yourself in the middle of a lake sitting in a row boat. You stand up to see something off in the distance. When you stand up, you feel the unsteady movement underneath your feet. Are you able to steady yourself as the boat moves under you? You decide the view is breathtaking and pull your camera up to your face from around your neck. You are now looking through a lens and focusing on a distant picture all while maintaining control of your body on an unsteady surface. How well are you able to do this, would this be a high challenge for you or not even take a second thought? Are your senses fully integrated during that challenge, can you meet the demands of the task? This is sensory integration. Sensory integration means our senses are complementing each other rather than out of balance. Our senses are more than the 5 outward senses we learn as a young child in the classroom. Yes, they include hearing, tasting, smelling, seeing and touch. However, they also include the vestibular sense and the proprioceptive sense, which give us information from inside our bodies and helps us balance and coordinate our movements. What are the Vestibular Senses? The vestibular system is very important to a child’s early development. The vestibular sense perceives balance, spacial orientation, and equilibrium. This system relays information to the brain that tells us where we are in space in relation to gravity. If our vestibular system is not functioning well, we would not be able to stand in that row boat. What is the Proprioceptive Sense? Proprioreception is your inner experience of where your body is and what it’s doing. It’s what allows us to pick up the camera and plant our feet to stabilize our bodies in the row boat. Proprioceptors are found in our muscles and tell us where our bodies are and what our bodies are doing. How does social and emotional development affect learning? Since then, all subsequent research shows that SEL does, in fact, enhance children’s academic success while preventing problems such as mental health disorders and violence. Social-emotional competencies, as defined by the list below, empower kids to grow self-aware and confident, to manage difficult emotions and impulses, and to embody empathy, which translates to not only improved behavior but also test scores. To understand how these 5 components of social-emotional intelligence (aka: EQ), affect learning, we must also look at brain-based research. SEL is all about developing neutral awareness and thoughtful choices (aka: mindfulness). To be able to respond rather than react, children need to cultivate the executive functions of their neocortex (frontal lobe of the brain) as well as the heart-centered intelligence of their mid-brain limbic system, which houses meaning making and memories. SEL helps children move out of their lower, automatic “reptilian brain” thinking and into higher, rational thinking and regulation, by establishing rules and activities that promote safety – physical, emotional and social – and teach respectful, kind and compassionate ways to think and behave. Classrooms that include SEL are organized around the principles of respect, kindness, and empathy. SEL teachers and lessons engage students in learning and practicing how to embody those qualities. This kind of environment encourages optimal brain development as well as social connection and collaboration. In other words, SEL affects learning by shaping children’s developing neural circuitry, particularly the executive functions. As children feel safe and learn how to inhibit disruptive emotional impulses, they exhibit greater self-confidence, better behavior and enhanced memory. They enjoy the learning process and thus, readily engage and fully immerse themselves in gaining new information and skills. Clear with expectations and guidelines. Consistent with appropriate consequences. Calm when angry. Caring when frustrated. Compassionate with everyone including yourself. Supportive with instruction & acknowledging of efforts. Never mock or shame. Give choices and respect wishes. Reflect on results. Don’t micro-manage. Ask questions that help children solve problems and self-regulate on their own. Be culturally aware and respectful. The Movement & Mindfulness Curriculum gives you everything you need to teach SEL and fulfill most other standards. Practicing meditation enhances your ability to be the mindful model & compassionate mirror. When you practice focusing your attention, rather than letting it jump around, you move into in your higher neocortex brain and your para-sympathetic (rest and digest) nervous system, and out of your lower survival, automatic brain and sympathetic (fight or flight) nervous system. You reset your mind-body into an optimal state. Most of us are programmed to do, act, accomplish. We do not value being, reflecting, processing. Even in the face of all the research that tells us the value of mindfulness practices, it’s hard for most of us to choose to take the time. We have too many things to do! But if you want to improve your capacity to teach SEL, it’s a requirement. What are Social Emotional Learning Standards? Social Emotional Learning (SEL) Standards list the intrapersonal, interpersonal, and cognitive skills woven into and necessary for functioning well in everyday life – at home, at work, and at school – for everyone. Though they differ slightly from state to state, these standards define social-emotional intelligence, which is really just the academic and neuroscientific breakdown of the attitudes, behaviors, and actions that make someone good to themselves, nice to know, and pleasant to work with. Because all the research shows that social and emotional competence is fundamental to academic and personal success, SEL is an essential and integrated part of every pre and primary school curriculum. How do movement & mindfulness activities support SEL? In The Whole-Brain Child, Dan Siegel and Tina Payne Bryson, encourage lots of active movement and sensory play for children. Why? Because the body is constantly providing useful information to the brain. They define being emotionally intelligent as knowing how to listen to and to use that information to both self-care and connect with innate wisdom. All child development experts agree that it is through play that children start to understand their thoughts and feelings as well as to practice how to appropriately interact with others. In combining active play with self- reflection and self-care, the Movement & Mindfulness Bundle helps kids be more cooperative and resilient. 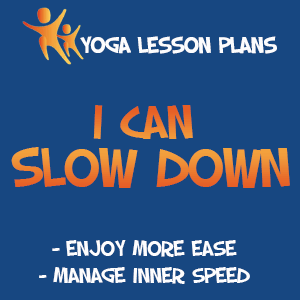 The yoga adventures and self-regulation techniques enable them to understand their feelings, embody ways to control impulses, and manage stress to do their best. The body and the mind are inextricably linked and our mind-body state dictates how available and/or able we are. Movement & mindfulness activities enable kids to regularly destress and reset their nervous systems such that they can connect, learn, and make smart choices. The more children move and play, the less stressed and more cooperative and learning ready they are. The more children learn how to slow down, relax, self-reflect, and self-care, the more they learn how to shift their own body-mind state. In his book Spark: The Revolutionary New Science of Exercise and the Brain, John Ratey, M.D. describes research showing that physical activity sparks biological changes that increase the brain’s ability to learn, adapt, and perform other cognitive tasks. Exercise builds brain cells, lifts mood, and ameliorates the detrimental effects of stress. Playful exercise and sensory awareness encourage children to explore their natural reactions and impulses. In the Movement & Mindfulness Bundle, the yoga stories invite children to move, pretend to be other animals and objects, try on a variety of emotions, and experiment with specific mind-body activities as self-regulation and social skills. The process of being everything in and acting out the story helps kids develop an awareness of the range of human experience. By naming these feelings and working with shifting them, kids start to be able to tame the bigger emotions that can sometimes overwhelm their young systems. Practicing self-care and regulation as play at a young age lays a foundation for social-emotional competence. Health, Academic, and Social-Emotional Competence starts at home with daily play and exercise. My interview with Marcia Washington reaffirmed some basic truths about child development that I want to passionately re-iterate! 1. Physical coordination precedes and lays the foundation for cognitive coordination. In other words, if you want to develop the mind, you must develop the body. That means multiple sessions daily of movement, play, and exercise. Per Marcia’s testimonial as a parent and a pediatric OT, it was doing the yoga story DVDs twice daily that enabled her son to build the motor skills, focus, and self-control needed for kindergarten. My point here is that regardless of your child’s challenges or strengths, if s/he is difficult, stressed, crabby, withdrawn, anxious, etc., s/he probably needs more physical play. Fun movement is the biologically built-in developer of body-mind-feelings awareness and management. At school, make sure students enjoy 90 to 120 minutes of supervised, instructional gross motor activity as well as outside time. At home, my recommendation is 20-30 minutes minimum every day – just you and your child, one-on-one, whatever s/he wants to do. 2. Mindfulness is a sensory-motor skill. Impulse control, emotional intelligence, self-regulation and executive function develop as children become aware of and understand what happens inside their own bodies. It is through interactive activity such as exercise instruction and pretend play that they build the inner sensory-emotional awareness necessary for self-control. Per the work of Catherine Rosasco Mitchell and others in embodied, sensory-motor education, we know that children can only access and understand their own perception, character, and relationships by using the feelings/sensations of the body. Play and intentional movement help them grow mindful as well as socially – emotionally competent. 3. To get the benefits, you have to do the practice. Marcia Washington, OTR/L, has been practicing pediatric occupational therapy for 20 years. In 2009, in her hometown of Pontotoc, MS, she launched KidSense, a clinic that specializes in pediatric therapy, includes a sensory motor gym, and serves clients from over a 70 mile radius. Marcia and her husband, David, have 2 biological daughters, Mattie – 14 and Ella – 10. In 2014, they adopted a 2 year old boy from Poland. Marcia helped Gehrig improve his language and overall motor skills using Rhythmic Movement, Integrated Listening, NeuroNet Learning program and the Alert Program “How Does Your Engine Run.” Yet core strength, posture control and unintegrated reflexes persisted to the point of causing inattentive/impulsive behavior in preschool. That’s when she started to use Move With Me Yoga Adventure DVDs and flash cards daily. She was so impressed with the results that she wrote us a thank you note. We were so touched that we invited her to speak about her experience so we could share it with all of you. Become a Movement & Mindfulness Curriculum Teacher! Subscribe to our newsletter and get Tips, Tools, & a FREE video download of the Magic Scooter yoga adventure.